Left to right: Karen DeHart, Steve Lambert, Erik Gandolfi. Photo courtesy Taylor Sanders and CLTC. 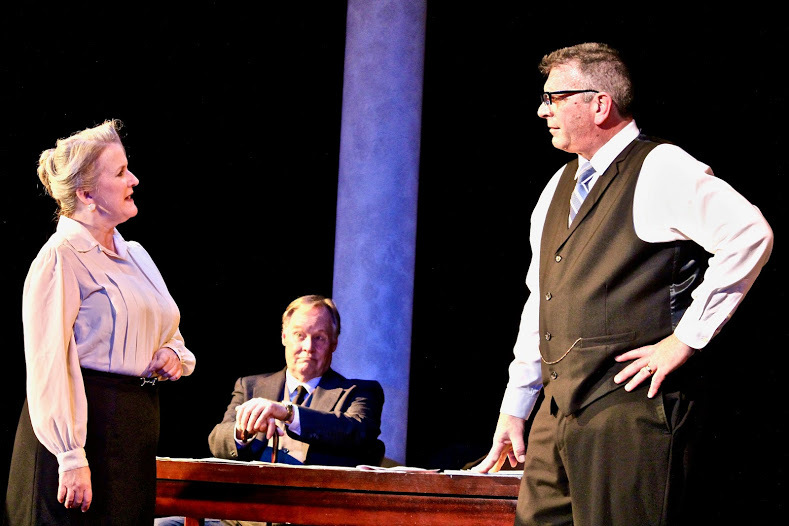 Kenneth Jones’ Alabama Story is in many ways the second coming of the classic play Inherit The Wind: A heartwarming narrative, based on a true story, about reason and togetherness emerging victorious over the evils of hate in a Deep South town. City Lights’ San Jose production, a West Coast premiere, is a play as uplifting as the children’s book about which it is written. Alabama Story’s most overt theme is racial integration and the fight over a children’s book that – at least according to Alabama’s white supremacist element – implicitly supported interracial marriage. The burgeoning Civil Rights movement and the actions of early protesters like Rosa Parks drives much of the action of the play. However, existing alongside the play’s message of tolerance is a subtler theme of the power of literature to touch anyone’s heart. The main character, veteran librarian Emily Reed (Karen DeHart), defends The Rabbits’ Wedding on the basis that books shouldn’t be censored. Even the antagonist, segregationist senator E.W. Higgins (Erik Gandolfi), continues to fund the library during the fight out of a childhood love of Tom Sawyer. Books in Alabama Story are the most important ideological boundary, and nobody in the play disrespects the boundary enough to truly step over it. City Lights’ cast brings the play to life. Gandolfi’s E.W. Higgins is the very picture of a Southern politician, employing a stentorian voice, Sunday morning delivery, and a passive-aggressive method of enforcing his will. DeHart’s Reed, on the other hand, stands opposite in every way: She displays a powerful inner strength while remaining humble and neutral. This emphasizes the clash not only between these characters’ values, but how they fight for them. Steve Lambert takes on a variety of roles, but the best is the elderly politician Bobby Crone, which he portrays with a mix of practicality and force of will. Jeremy Ryan plays Reed’s charming assistant Thomas Franklin with innocence, charm, and well-meaning righteous anger. Meanwhile, Bezachin Jifar and Maria Giere Marquis portray star-crossed lovers Joshua and Lily; their chemistry is evident whether they’re sharing small talk or reckoning the reality of a Jim Crow South. While some plays benefit from a wild technical approach, the design team of Alabama Story wisely knew when to experiment and when not to. Standing out most is scenic designer Ron Gasparinetti’s proscenium archway of book-shaped projector screens: Though they’re noticeable while the audience gets settled and awaits the show, it’s employed subtly so it doesn’t draw focus away from the actors. The tiered floor of the set also serves, along with Mia Kumamoto’s insightful, economic lighting work, to define the multiple plotlines that run simultaneously during the show. Alabama Story at City Lights is a comforting tale of the triumph of knowledge over ignorance and a future classic. Lovers of Twelve Angry Men and, as mentioned, Inherit the Wind, will especially enjoy the play’s timeless themes and well-defined characters.